A few weeks ago I came up with an idea for a cute little maxi skirt. I knew it had to have two tiers. The bottom tier had to be lined with lace peaking from under the top layer. The image of this skirt was very vivid, so I knew I had to make at least one for Little Monkey. The skirt is simple and didn't take very long to make. I used grey corduroy, lightweight white cotton and lace my mum brought from Russia. While she was sleeping, I put the ingredients together, and made this little skirt. I called it the Daffodil skirt. The skirt has not got pockets or buttons, so I must admit I was a little worried Little Monkey wouldn't even look at it. Surprisingly, she really liked it. Little Monkey put it on straight away and started twirling! She even allowed me to take a couple of photos... rather reluctantly! Gotta love her facial expression! She looked a little more excited once we got to a playground. Little Monkey by name, little monkey by nature. Don't you wish you had this much energy? I certainly do! I was a little worried the skirt would not allow her to monkey around, but it looked like Little Monkey was very comfortable. I was pleased Little Monkey wanted to wear her fabric covered bead necklace with the new skirt. I think I want to make a summer version of the Daffodil skirt now it is getting warmer! Do you like this skirt? Would you like to make one or two for a special little monkey in your life? Then click on Read more for a tutorial. I will tell you how I made this skirt, share ideas as to how else things can be done, as well as what I will do differently next time. decided how 'deep' I wanted the waistband to be. For the skirt: the width of the top tier of the skirt is the waist measurement multiplied by 1.4, plus preferred seam allowance. So the width of each panel for the top tier is half the waist measurement multiplied by 1.4, plus seam allowance. The width of the bottom tier and the lining is the waist measurement multiplied by 2, plus preferred seam allowance. 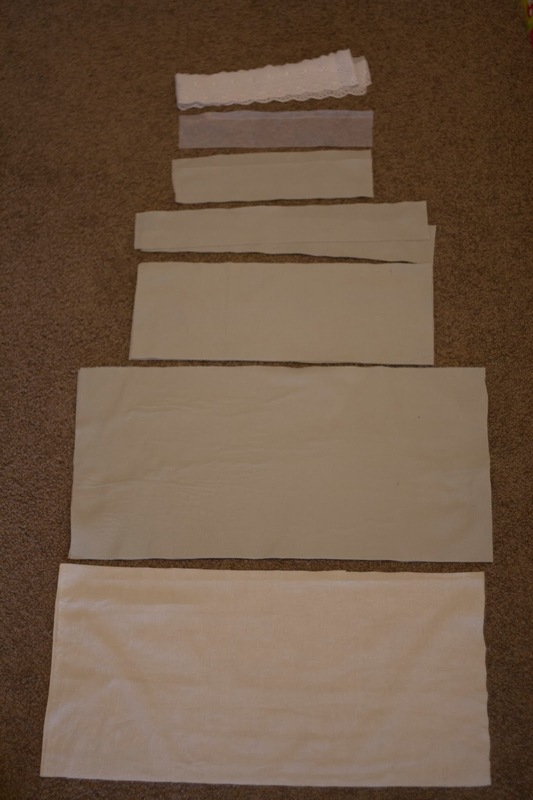 So the width of each panel for the top tier is half the waist measurement multiplied by 1.4, plus seam allowance. If you are not using lace make the lining a little longer. The length of the bottom tier is the length of the skirt minus the length of the top tier. I think next time I make this skirt I will multiply the top tier by 1.5 and bottom by 2.5 to give it a greater twirling factor. For the front of the waistband: to calculate the width I used the waist measurement and divided it by 2, then added seam allowance. To work out the height I used the elastic as a guide and made sure there was a little room for it to move, plus seam allowances. For the back of the waistband: the height of the front waistband piece and the width of the top tier of the skirt. If making waistband sounds like too much hassle you can make a usual elastic casing. Just make sure to add extra length to the top tier to be able to fold the fabric to make an elastic casing. 2 pieces of bottom tier cut out of main fabric and 2 pieces cut out of lining. Now the annoying part was done it was time to start putting the skirt together! 2) I put two pieces of lining right sides facing and pinned them in place. 3) I stitched one side and overcast the raw edge. I have an overlocker (aka serger), and I am not afraid to use it. If you don't have an overlocker you can use a zigzag stitch to stop the fabric from fraying. 4) Next, I pressed the seam. 5) I pinned lace to the lining, right sides facing. 6) Stitched and overcast the raw edge. 8) Topstitched close to the seam. 9) Pinned the other side of the lining with right sides facing. 10) Stitched, overclocked the raw edge and pressed the seam. I chose to not cut my lace as I didn't like the idea of matching the motif. If this doesn't sound right to you, you can cut two pieces of lace, attach them to the bottom of each lining part, stitch, overcast and press, sew the sides of the lining together and the topstitch. As my sweetest husband says, there is more than one way to skin a cat. 11) Now it was time to make the bottom tier out of main fabric. I pinned both sides of the bottom tier with right sides facing. 12) Stitched and overlocked the raw edges. Ta-da! I had the bottom tier made out of main fabric. 17) Next, I put the lining inside the main fabric making sure both pieces lined up nicely. Because I used the same measurements for the main fabric and the lining, my lining ended up a little longer after I hemmed the main fabric. Not a drama. 18) I pinned both layers together. 19) Stitched them together close to the edge and trimmed the lining. 20) Next, I repeated steps 11 - 13 for the top tier. 21) It was time to do some gathering. I stitched two rows of basting (wide stitches) close to the edge. 22) I gathered the bottom tier so it was the same width as the top tier and distributed the gathering evenly-ish. 23) Placed the top tier inside the bottom tier with right sides facing and pinned them in place. 24) Stitched and overlocked the raw edges. 25) Pressed the seam and topstitched close to the edge. 26) With right sides facing, I pinned each front part of the waistband to a back part. 27) Sewed them together, trimmed the edges and pressed the seams open. 28) With right sides facing I placed one half of waistband inside the other. 29) Pinned two halves of the waistband together. 30) Stitched and trimmed the seam. 31) Turned the waistband right sides out and pressed. 32) Then I pressed the seam allowance on the non-interfaced side of the waistband inside. Checked to make sure the waistband was even. Then I topstitched at the top of the waistband, which you can clearly see in the following photos. I am not going to do this at this point next time I make this skirt. Oops. 33) I gathered the front of the skirt only as described in steps 21 - 22 so the side seams of the skirt lined up with the side seams of the front part of the waistband. 35) Stitched and trimmed excess fabric. 36) Topstitched close to the edge at the top of the waistband. This really is a better time to do this. 38) and stitched close to the edge starting at the side seams all around the back of the waistband. 40) Then I secured the elastic by stitching two lines parallel to the side seam as shown in the photos below. 43) Last step - I stitched the bottom of the waistband at the front of the skirt. I'm impressed! Not only the skirt, which is lovely, but also your tutorial! Looks so well organised and carefully photographed. I am such a chaotic sewer! I'm not really sure what I'm doing and make it up as I go along, so whenever I think about doing a tutorial I get nervous! BEAUTIFUL lace, Jenya and a fabulous skirt!!! I love the lace peaking out as an under layer. As always, such a detailed tutorial. Love this skirt, Jenya! I'm off to poke around on your blog! LOVE this! Great tutorial :) The lace underneath is so cute! I great skirt with a great tutorial! I really love the lace at the bottom. I'd love for you to link your outfit to our Fall Clothing Party!!! Very pretty. I love how you used the elastic in the back but did a flat front. I am pinning this for a future project. Oh this is super cute. We will be sharing this pattern soon with our readers on Sew Modern Kids, and sending them over here.